As I’ve noted before, the most dangerous places in America are the places where liberals reign supreme—large U.S. cities. The city of Chicago is infamously a significant part of this violence. Tellingly, 80 percent of the shootings in Chicago are classified as gang-related. And what is one of the most common traits among American gang members? Broken families—especially those involving fatherless homes. Yet, in a foolish tweet that followed the tragic death of Nykea Aldridge (Dwyane Wade’s cousin) in Chicago—another victim of senseless gang violence—where Donald Trump brazenly (and in all likelihood wrongly) declared that “African-Americans will VOTE TRUMP,” he failed to make note of the breakdown of the family. It seems to me if one is going to politicize a violent death (something Obama and his minions have done often, including this incident) one should do so in an intelligent manner. If Mr. Trump wants to endear himself to black Americans who have long suffered under the policies of Democrats, he should regularly and loudly point out how complicit is the party of liberalism in the destruction of the black family and how this destruction has led to the violence that is killing literally thousands of black Americans annually. Likewise, after the death of his cousin, Dwyane Wade decided to have a “conversation” about the violence that plagues Chicago and other urban areas in America. Several of Wade’s cohorts from the elite world of professional athletics participated in the discussion, and ESPN hosted. There were many mentions of “gun violence” but not one mention of the breakdown of the family. There was also the mention of “mentoring.” I wonder how many of the athletes featured in this discussion actually “mentor” their own children—you know, by having a faithful marriage to the mother of their children. And how many of these athletes are practicing what they preach by not fathering children out of wedlock? Surely such “men of conversation” are aware that children born out of wedlock are much more likely to embark on a life of thuggery and violence. Until the real problems that result in gangs and violence are addressed, these “conversations” are an embarrassing waste of time. Speaking of athletes who waste their time, any athlete who expends any amount of time and energy perpetuating the lie that is the narrative of the Black Lives Matter movement may as well lose themselves on the interstate while driving to their stadium. Yes, Colin Kaepernick, that means you. If Mr. Kaepernick wants to sit in protest—even against the nation that has afforded him so much— fine, but at least find a worthy cause. I think it’s fair to conclude that Mr. Kaepernick has completely swallowed the lies of Black Lives Matter. As has been frequently documented recently, the vast majority of the “bodies in the street” to which Mr. Kaepernick refers are the result of young black American males killing other young black American males. And again we come back to the breakdown of the family. When are these athletes going to stand up for marriage and the family? Where’s the chorus of those who will join with the likes of the NFL’s Ben Watson and speak eternal truth to a nation that is desperate for it? And if one wants to protest a flag, why not protest the rainbow flag of the perverse homosexual agenda? (Do you think those in the media, or the NFL, who support Kaepernick’s right to protest the U.S. national anthem would be so accommodating if he stood against the homosexual agenda?) Where were the player protests when the NFL threatened the state of Georgia (a threat to which the governor of Georgia cowardly succumbed) when a tame religious liberty bill was being considered? Woe to those who stand up (or sit down) for lies but are silent when the truth is under assault! 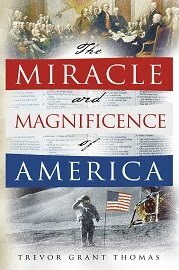 Furthermore, as I note in my recently published book The Miracle and Magnificence of America, the United States of America has been one of the greatest instruments for good the world has ever known—a fact about which Mr. Kaepernick demonstrates stunning ignorance. With our military might, we have been an unequaled force for freedom and liberty around the world. We have liberated millions and defended millions more. For every human being enslaved in America, hundreds-of-millions more have been freed due to the brave and selfless efforts of Americans. America is the most generous nation the world has ever known. Americans account for nearly half of all the charitable giving in the world. The vast majority of these contributions are private, not government, funds. Whether wars or hurricanes, floods or famines, earthquakes or tsunamis, with our abundant human, natural, and technological resources, time and again Americans have come to the aid of their neighbors around the world. In addition, according to Mark Tooley, “America accepts more immigrants, about a million legally every year, than any other nation and, by some measures, than all other nations combined. America permanently resettles more refugees than any other nation.” Most importantly, the U.S. sends out more Christian missionaries than any other nation, nearly tripling the second place nation, Brazil. In other words, Mr. Kaepernick, the United States of America, the nation in which you (and countless others like you) became rich and famous, has given you little reason to protest—much less reason than any other nation in the history of the world.